In the fourth edition of Red Hot Hockey, Terriers led #14 Cornell 3-0 early in the third period, then held off a furious Big Red Rally—and survived a two-man Cornell advantage in the final minutes—to come away with a 3-2. 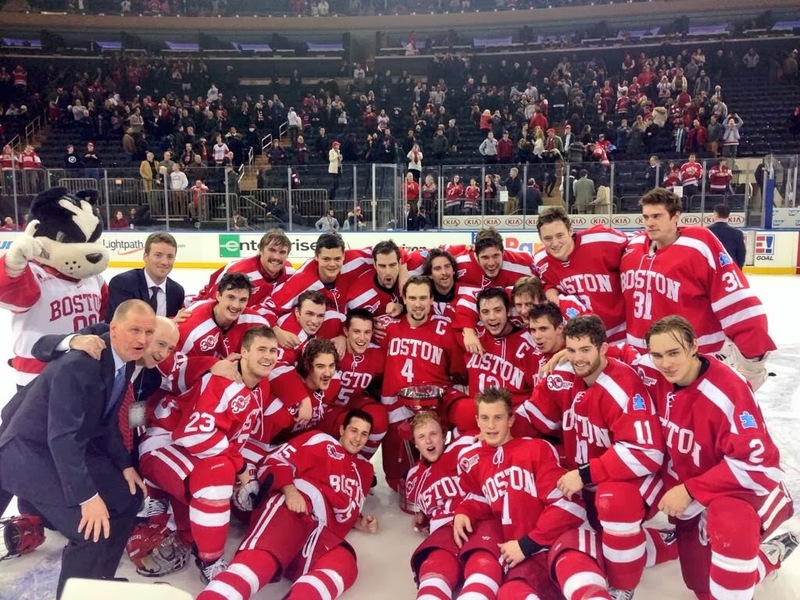 The victory, at a raucous Madison Square Garden, gives BU a 3-0-1 record in the series that began in 2007 and marked BU’s second win in two weeks against a ranked opponent. 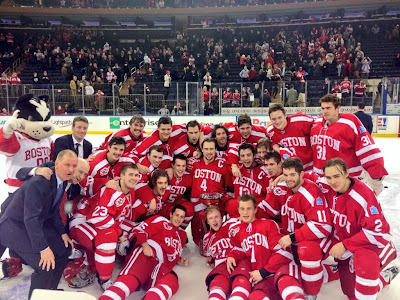 The win also gave BU possession of the newly-named Kelley-Harkness Cup, named after legendary coaches Jack Kelley (BU) and Ned Harkness (Cornell). Sophomore goalie Matt O’Connor once again was a standout in goal, stopping 35 of 37 Cornell shots, many from close to the crease. Terriers, who were challenged all night by Cornell’s forechecking and relentless cycling in the offensive zone, took seven penalties, but killed them all, including a 5 on 3 in the second period. Cornell came into the game with a 29.6 percent power play success rate. Despite being outshot 10-3 in the first period, BU took a 1-0 lead at 17:50 when Mike Moran, parked to Cornell goalie Andy Iles’ right, one-timed a slick Danny O’Regan pass. Terriers doubled the lead in the second period on a give-and-go with Robbie Baillargeon finishing a goalmouth pass from Evan Rodrigues. It was Baillargeon’s fifth of the season. BU extended the lead early in the third when Kevin Duane grabbed a deflected shot and backhanded a pass to Nick Roberto whose one-timer beat Iles. Cornell go on the board a minute and 20 seconds later when the puck deflected off Christian Hilbrich’s skate past O’Connor. A review by the referees upheld the goal, to the dismay of the Terriers and their fans. Cornell kept pressing and, just after several BU threats, they cut the lead to one at 16:30 when Cole Bardreau got behind the Terrier defense to slap home a centering pass from just outside the crease. In the final minutes BU’s seventh penalty of the night and a pulled goalie, gave the Big Red another two-man advantage, but strong penalty-killing, especially by O’Regan, held them off and nearly added an empty netter. Quinn also strongly hinted at dissatisfaction with the officiating, which sent BU to the box seven times and Cornell just twice. ►In its last 20 penalty kills, BU has given up just one goal. ►Baillargeon and Roberto are now tied with O'Regan for the team goal-scoring lead with five each. Baillargeon also had a strong night in the face off circle, winning 13 of 20 draws. ►No game stars were awarded, but Matt O'Connor was clearly BU's top performer. 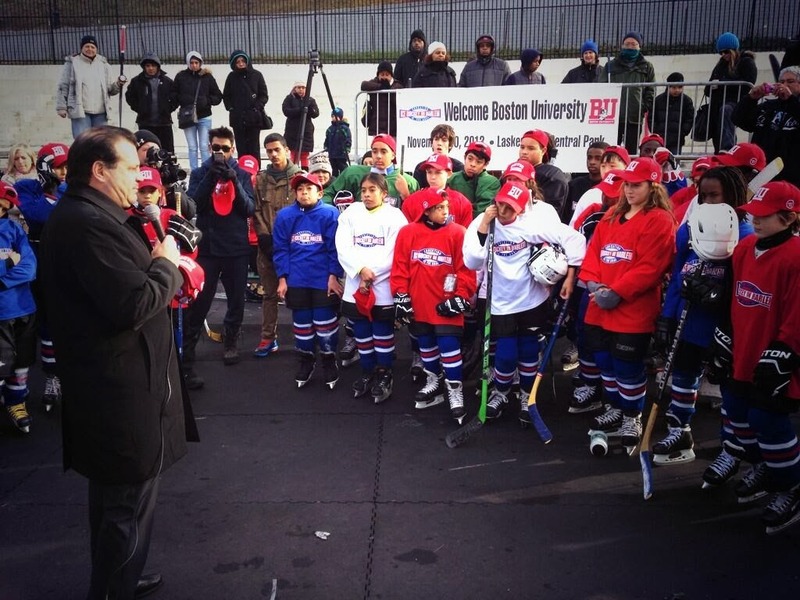 ►Earlier in the day, the Terriers, along with former BU captain and U.S. Olympian Mike Eruzione (photo), were in New York’s Central Park a guest instructors for Hockey in Harlem. More photos: 1, 2. 2014 recruit Jack Eichel scored his team-leading 17th goal of the season as the NTDP U18s blanked Nazareth College, 4-0. 2015 recruit Vasili Kolias scored a power play goal for Chicago Mission U18 Midgets, who were edged by Hill Academy, 2-1.